A couple of days ago I wrote of what to do when you come to the end of your rope. Basically what I said was when you come to the end of your rope don’t tie a knot and hang on instead with faith in God let go. This morning I want to assure you when you do get to the end of your rope and let go you will fall softly at the throne of God where Jesus patiently waits for you. In chapter 4 of Hebrews the author describes what Jesus is waiting to give you. For some the biggest struggle is asking Jesus for help but that’s not my biggest struggle. Mine isn’t letting go of my rope I’ve learned repeatedly holding on doesn’t work, my struggle is letting Jesus help me in his own way rather than me dictating how I think he should help me. One of the hardest lessons for me to put into practice is Jesus doesn’t need my help because he’s faced and experienced life the same as I have he knows what to do and when best to do it. Jesus isn’t necessarily about fixing our problems or clearing our minds of those things that trouble us Jesus is about strengthening us for the journey and when needed to temporarily carry us through the dangerous “mine fields” life puts in our path. 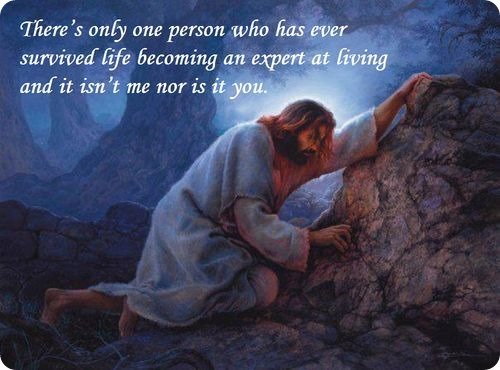 There’s only one person who has ever survived life becoming an expert at living and it isn’t me nor is it you.